The patron saint and national apostle of Ireland was actually kidnapped and brought as a slave to Ireland when he was 16. But he escaped slavery and brought Christianity to Ireland. Isn’t that awesome? 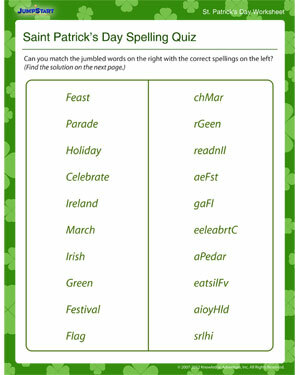 Test your St. Patrick’s Day vocabulary with this printable worksheet for St. Patrick’s Day. And when you’re done, try other St. Patrick’s Day worksheets that combine fun with learning!